Metal Mining in Cumbria’s western area was dominated by the large deposits of high grade hematite iron ore found in the limestone strata and lesser quantities in the Eskdale granite and Skiddaw slates on the western fringe of the Lake District. In the north of the mining field many deposits were found at outcrop and it is no doubt these that were first exploited, possibly by the Ancient Britons and certainly by 12th century miners. Faults in the limestone were filled with hematite giving vein-type deposits, flat deposits were formed where a particular limestone strata was replaced and ‘sops’ was the name given to large karstic dissolution features subsequently filled with iron-ore. Cavities or ‘loughs’ were not uncommon in the flats, usually lined with kidney-ore and occasional crystals of specularite, calcite, barite, quartz, dolomite or fluorite. Cavities where less common in the softer ores of the Furness area. that west Cumbria had. The depressions of the 1920`s and exhaustion of shallower deposits finally brought closure to most of the mines, Florence mine being the last to close in 2006, the decision by BNFL to no longer cover the costs of pumping water out of the mine bringing about its final end. For an area that produced many spectacular minerals it is surprising that so little has been written of their occurrence; vagueness seems a characteristic of specimen labels from here (possibly deliberate) locations given often being the nearest town such as Frizington or Egremont. Confusion comes also from the mining companies naming of their workings. Most mines consisted of numerous shafts, and at some a shaft or `Pit` might be given a different name from that of the surface mine. There was a Wyndham mine at Egremont and one at Bigrigg, completely separate mines some miles apart. Additionally if a mine was sold the new owners would in some cases change the name of the mine whilst keeping the shaft names as before. Some of the horizontal ore bodies were so large that they were worked from a number of mines and numerous shafts. For example Crossgill, Parkside, Frizington Parks, Goose Green and High House mines worked the same body of ore which extended laterally over 16 hectares. In later years Beckermet, Florence and Haile Moor mines were worked as one mine. Hematite specimens occurring as `Kidney-ore’ were found to some degree in most of the area`s mines, the list of mines below are those that have produced a variety of other minerals. Any information to add to the list would be welcome! shaft (pictured top left and also called the Winscales Pit) reaching a depth of 1247ft. A further body of ore was found to the east where, in 1939, the company sunk Haile Moor shaft. 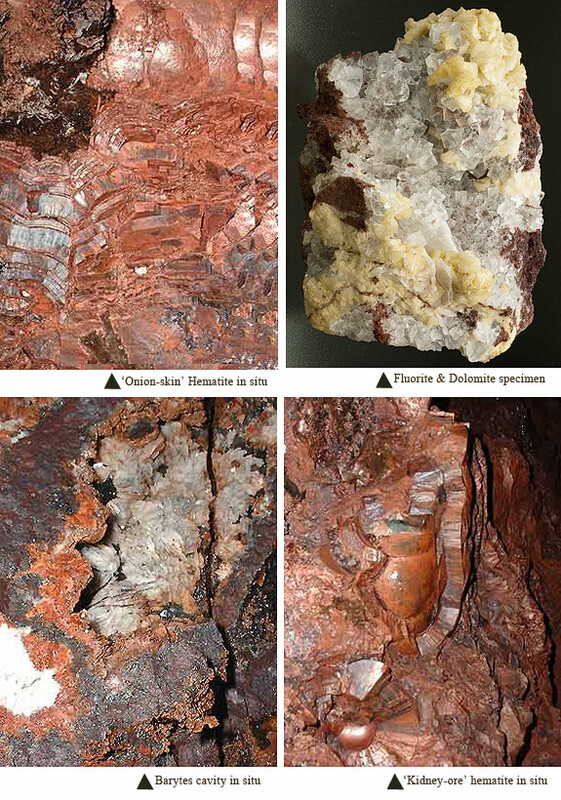 Most of the minerals found at Florence were found here and along the Banana Slide fault many attractive groups of hematite stained calcite were collected. Ralph Sutcliffe shot some pictures of the cavity soon after the find in about 1971 and has kindly lent them. Small pyrite crystals are reported from here too. Haile Moor produced barite specimens similar to those at Florence, calcite and aragonite. often referring to a pit of a different name but located in the area of Bigrigg village. An 1865 OS large scale map does not show a ‘Bigrigg mine’ but has a William Pit, Hay Pit and James’s Pit marked in the area south of the village. However the 1899 edition does show a Bigrigg Mine in the area of Wyndham pit. The catalogue of abandoned mines states that a Bigrigg mine was abandoned in 1932 but further inspection shows that it refers to Lord Leconfield’s Croft Pit. There has also been a Bigrigg Mining company but it appears to have worked shafts to the north east of the village and other areas in west Cumberland and was taken over by the Workington Iron & Steel Company during WW1. The balance of evidence therefore suggests that Bigrigg mine encompasses the pits to the south of Bigrigg village - Croft pit, Wyndham (or Langhorn) pit, James’s’ pit, William pit, Hay pit and Lady pit. 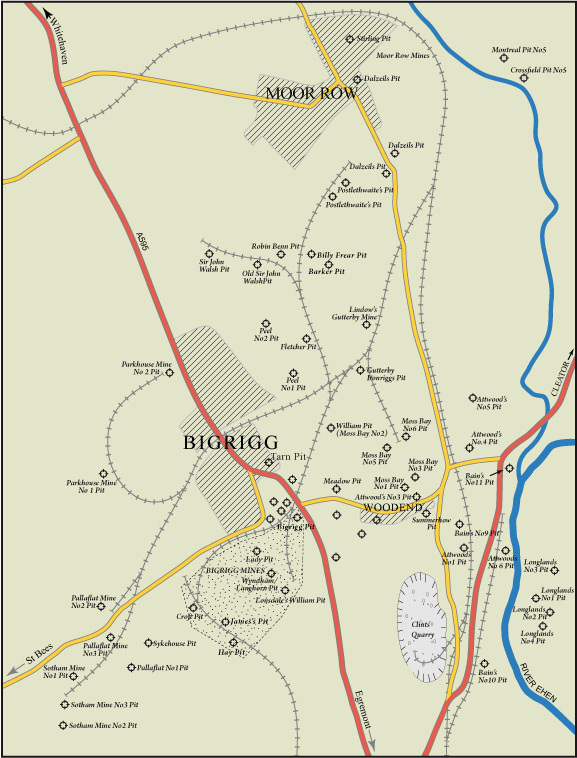 Additionally though, as the area has been mined for many centuries and many pits have been sunk specimens may also be labeled ‘Bigrigg’ simply because Bigrigg village is the nearest urban area to where the specimen were found. Specimens from the Bigrigg area include superb glass clear scalenohedral calcite and ‘Butterfly’ twins often with inclusions of manganese minerals. Fluorite is reported from Langhorn mine as pale yellow cubes. 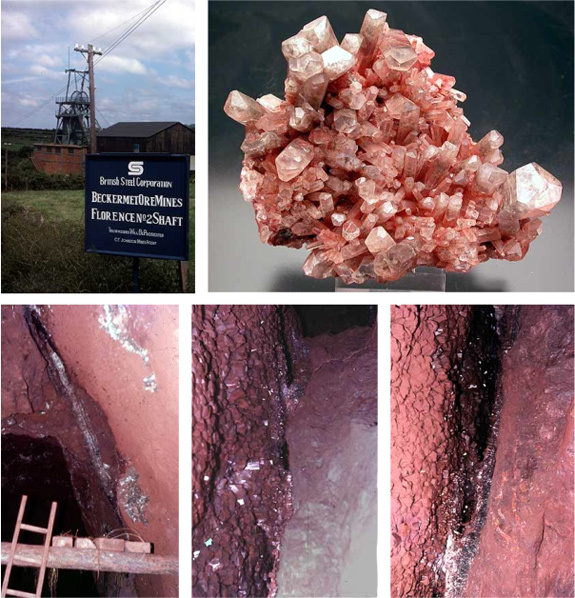 Hausmannite, braunite, pyrolusite and rhodocrosite also occur, lumps of ‘manganese’ ore being found several feet across, sufficient to warrant mining in the 1870’s. Good examples of Kidney-ore here too. Mining started here as early as 1753 working north of the main Cleator Moor road. In 1825 Crowgarth pit was then sunk south of the road with York pit, St. John’s pit and No.4 pit subsequently being sunk between 1870 and 1882. Mining continued until the economic depression of the 1920’s and caused a great deal of surface settlement in Cleator moor as the mine followed the shallow ore-body upwards. Crowgarth is known for its fine clear, blue and yellow barite specimens some with hematite inclusions. Also quartz with specularite and small chalcopyrite crystals. York Pit produced pencil-ore of such good quality that it was sold to the German jewellery trade and dolomite pseudomorphs after Kidney-ore are also reported. Famous for large groups of flat topped and spear shaped barite crystals of lustrous pale yellow to chocolate-brown colour. 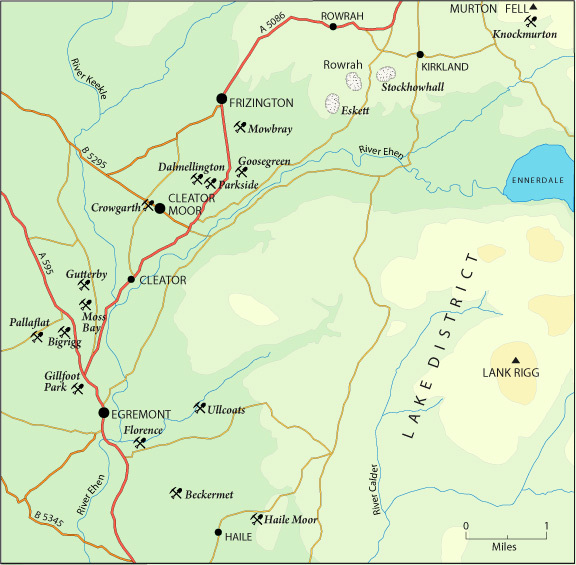 ‘Dalmellington mine’, as a location given on old-time specimen labels can only be geographically identified by inference. There are no returns for a mine of this name but The Dalmellington Iron Company, a Scottish company opened the Holbeck Mine in 1869 and worked it until 1900 when it closed. This included extracting ore from the Dalmellington fault. One shaft (No.7) was then transferred to the Parkside Company operating Parkside mine nearby. Originally operated independently. Florence was the name given to the second shaft sunk at Ullbank mine and the most recent mine was centred round Florence No.2 shaft, sunk in 1945 and a later drift driven from surface. At Ullcoats the first shaft was sunk in 1900 followed eventually by a further six, three of which though were abandoned during sinking because of difficulties with the glacial deposits immediately above the orebody. In 1917 the mine was taken over by the Millom and Askam Company who owned the nearby Ullbank/Florence mines. From then it was operated as a single complex and connected underground to Florence in the 1950’s. It proved to be a long and lonely work for the small number of men driving the connecting drift and this part of the mine became known as `lonely hearts`. Both mines were closed in 1968 when the company went into liquidation following nationalisation of the steel industry. In 1969 the lease was taken by the Beckermet mine which after the nationalisation became part of the British Steel Corporation. 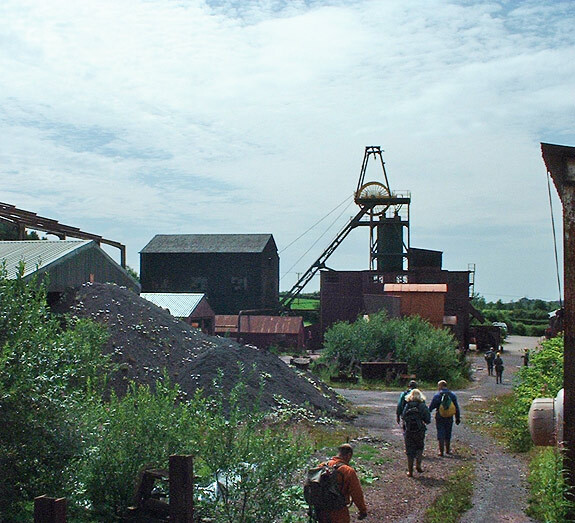 The company operated the mines until 1980 when the Egremont Mining Company took over and worked them until 2006 the ore being used primarily for use as a pigment. The Egremont Mining Company was formed from ex-employees and helped by the need for large quantites of water by the nearby nuclear plant BNFL. For specimens the mines are famous for the superb sea-blue fluorite on creamy coloured dolomite. Occasional zoned green and purple fluorite were also found as were attractive specimens of clear transparent cubes coloured to varying degrees of brown by hematite inclusions associated with kidney-ore, dolomite or barite. 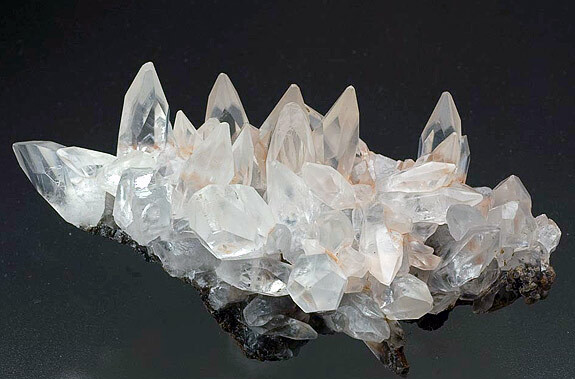 `Kidney-ore` hematite often in large specimens was found and groups of specularite and quartz (clear and smokey) provide particularly aesthetic pieces. Red `Eisenkeisel` quartz on kidney-ore occurs and barite from Florence is usually white to pink and of a platy habit. In the early 1990’s an unusual find of white spheroidal calcite on specularite was found. In all six pits were sunk on this property, the first ore raised from No.1 pit being in 1879 by the Gillfoot Park Mining Company who worked the mine until it was taken over by the Wyndham Mining Company in 1901. Gillfoot Park was the source of many good calcite groups often showing twinning in the form of ‘butterfly’ twins. Good kidney-ore. The Parkside Mining Company began mining here in 1855. Ownership changed in 1875 to the Goose Green Iron Ore Company, who worked it until 1892. Known for green and brown barite crystals often with hematite inclusions, specular hematite and calcite. These mines are situated on the edge of the Lake District National park, the numerous veins here occurring in Skiddaw slate rather than limestone. Knockmurton was started in the 1850’s with output increasing following the opening of a rail connection to the main network. The first shaft at Kelton was sunk in 1873 after which substantial tonnages were mined from these relatively remote mines, with a maximum tonnage of 61,000 tonnes in both 1882 and 1883. Substantial mining ended in 1913 with a small re-working attempted in 1920. The veins pinched out in depth. Substantial amounts of kidney ore occurred in lough holes, often with small quartz crystals. Started in 1864, a total of four pits were sunk and eventually the old Dyke Nook mine was included in the workings. After 1903 it was owned by Cammell Laird & Co who worked the nearby Frizington Park mine and No.3 & 4 pits were extended to work in that royalty. Final abandonment came in 1921. Well known for barite specimens of many different hues from colourless, pale yellow and yellowish-green to brown, greenish-blue and sky-blue. Any specimens of a blue colouration are likely to have altered in daylight from yellow. Fluorite, hematite and dolomite are reported from here whilst marcasite crystals were collected from the dumps. No.1 shaft was working by 1884 after the Pallaflat Mining Co. was formed in 1874. Two other pits were added before closure of the mine in 1914. Well known for its exceptional calcite groups of clear, transparent nail-head and scalenohedral crystals with some ‘Butterfly’ twins. Occasional pieces are coloured red or brown on one side due to a dusting of hematite. Also combinations of transparent pastel green barite crystals with calcite. The dumps were worked in the 1980’s by collectors when a substantial number of specimens were recovered. Started in 1855 by the Parkside Mining Company. It soon becoming a very successful mine with, for example, over 100,000 tonnes of ore being raised in 1873 from a huge flat deposit in the First limestone. However by the mid 1870’s output was declining rapidly and when the royalty was renewed in 1875 the property to the east of the road was split between the Goosegreen Co. and the New Parkside Co. In 1877 the company opened up ore in the Fourth limestone sinking a new shaft (No.19) and in 1894 took over the Crossgill mine which had worked the same shallow body of ore and the Dalmellington No.7 pit. By 1913 Crossgill mine was the only part left working and all were closed by 1925. The Parkside Company worked a number of mines in West Cumbria and numbered their pits chronological with no reference to a specific mine so although Pit No.19 was at Parkside, this does not imply that there was that number of pits at Parkside, for example Pits Nos.11 & 14 were at Salter and Pit No.20 was at the Winder mines in the Windergill valley! Exceptional barite specimens were found here with crystals ranging from a clear pale yellow colour to a rich chocolate brown often long and slender on a characteristic open dolomite matrix. Calcite crystals, dolomite, hematite and quartz are also reported, as were pseudomorphs of hematite after scalenohedral calcite. The mines of Furness were not noted for mineral specimens compared to the prolific output from the mines of West Cumbria. However occasional specimen from two of the mines do come on the market, Hodbarrow and Stank. The largest mine in terms of iron ore output in Cumbria with an interesting history well documented in ‘Cumberland Iron’ by A. Harris; D. Bradford Barton Ltd. (1970). Kidney ore was not uncommon and specimens of hematite pseudomorphing fluorite are known from here. The first shaft was sunk in 1871, the mine eventually proving to be quite a substantial undertaking with two and a half million tonnes of iron ore being produced up to 1885. In all some nine pits were sunk, the pumping machinery including a Cornish beam engine originally from Wheal Mary Ann near Menheniot, Cornwall. The mine finally closed in 1901. Mineralogically it produced groups of bright scalenohedral calcite coloured shades of red, yellow and brown and often with hematite inclusions. Pseudomorphs of hematite after fluorite and scalenohedral calcite occur with rounded outlines to the original crystals.